Posted on November 18, 2018 by David M.
This Wednesday was a surprisingly violent day to go birding. We have been out when it was colder, and when it was wetter, but perhaps never when it was windier. This particular tempest restricted us to leeward microclimates from which we could look for birds. Dave Weaver said it was the worst that he’s ever seen. 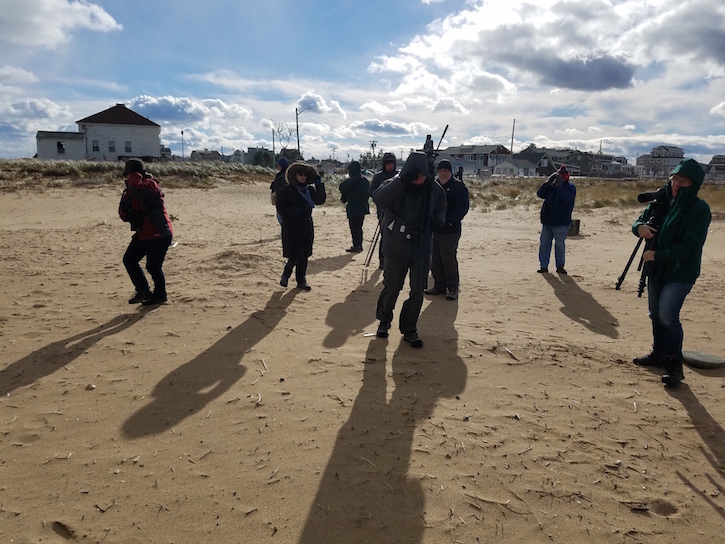 We went first to the north end of Plum Island, because there had been reports of many seabirds before the storm came, and we were hoping that the winter season had begun, when flocks of scoters, eiders, and others shelter in the mouth of the Merrimack River. I have to admit some personal folly as well, as I enjoy wild weather, and thought it might be a hoot out there. Instead, it was a rout, plain and simple. I tried using the crazy goggles I have, with which I can usually look into strong, cold wind, but they were not enough help. As we approached the steep berm at the edge of the water, the biggest pieces of beach sediment hit and stung our faces with their force, and there was just no way to look out at the water for any length of time, let alone search for birds with optics. The lenses would have been scoured. We’ve all been birding on beaches with the sand blowing around and nipping at ankles, but this was different. Dave Weaver estimated the wind at 25-30 knots with gusts of 40-50. I believe him! Birds to report on the river: zero. After such a defeat, one thinks, “Okay, so now what?” We didn’t push too hard to work our way down the road on Parker River National Wildlife Refuge, stopping to look for waterfowl in the salt pannes. There were a few American Black Ducks. The Northern Shrike from the day or two before was neither found nor expected at the top of a tree in the tempest, as it probably had better ideas of survival. As we passed the smaller pannes south of the Main Panne, three Snow Buntings flitted across the road in front of the lead van, and we and a few others were able to spot them from inside the warm confines of our glass and metal encasement as they landed on a strip of marsh. We had a tip from MaryMargaret Halsey of two American Bitterns at Hellcat, so we scurried past The Warden’s. Sure enough, one of those bitterns was hunched in the Common Reeds byBill Forward Pool, with an expression that seemed to say, “What did I do wrong? How did I miss that this was coming?” No more birds appeared other than the gulls that we saw being tossed all morning, mile after mile, and one Great Blue Heron that somehow flew into the galeto reposition itself closer to the middle of the marsh. The parking lot was calmer, and looking back I realize we should have spent more time with the few surviving songbirds we might have found besides the one female cardinal we did see there. Things were not much better on the beach from parking lot #7, though the dunes did create little pockets of relatively calm, sunny space. A difference of a few feet one way or the other made standing there doable, and we spent some time to enjoy sighting Common Eiders, Red-throated Loons, and Red-breasted Mergansers moving around foraging areas near the exposed rocks. A few scoters went by, maybe even four. One Black-bellied Plover and one Sanderling still hung on. One each! Gannets were far out at sea, too far to see. Thinking it would be kind to make restrooms available if nothing else, we returned north to The Warden’s. Hopping out of the vans and marching straight to the sheds to shelter in the lee of the gale worked pretty well, allowing us to watch about 150 Canada Geese overhead struggling mightily to stay in any kind of formation and work their way south. They looked more likeDouble-crested Cormorants from a distance, with the sloppy, shifting formations they came up with. One hopes they had excess fuel for the journey. Recently, we have heard that seabirds can be found off the beach at parking lot #3 due to deeper water there, so we gave it a try. It was pretty easy walking east, propelled by the northwesterly wind, and we spotted a couple of Northern Flickers inexplicably out and about. Behind the low dunes there, we found little protection, but we came up with only another loon, a couple of female Common Goldeneyes flying north, and an interesting flock of Dunlins foraging on the edge of the water. 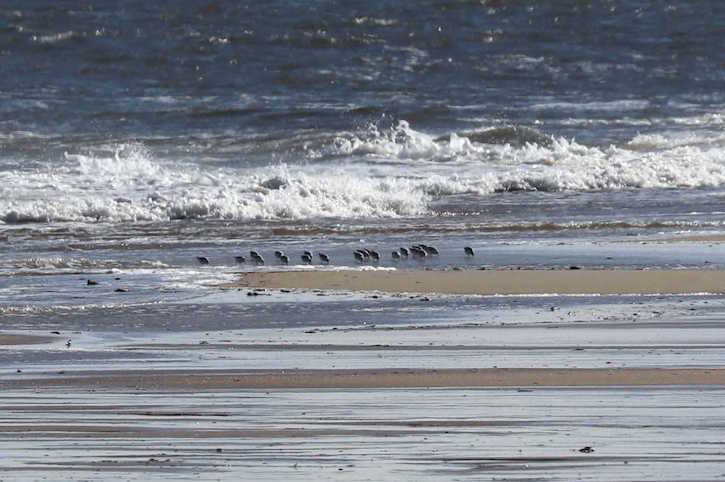 Individuals would stop their searching for prey in the sand to run behind another in the flock to get some shelter, which meant the flock faced the wind and kept drifting along as birds scurried so as not to be the one in the teeth of the driving, airborne sand. It was a beautiful if pitiable choreography. As you will see from the short list below, that was about it. This fall continues to be one of feast and famine as far as finding birds on Plum Island is concerned, though every time we are there our spirits are wonderfully enriched by the changing natural scenes we find around the Great Marsh each week. 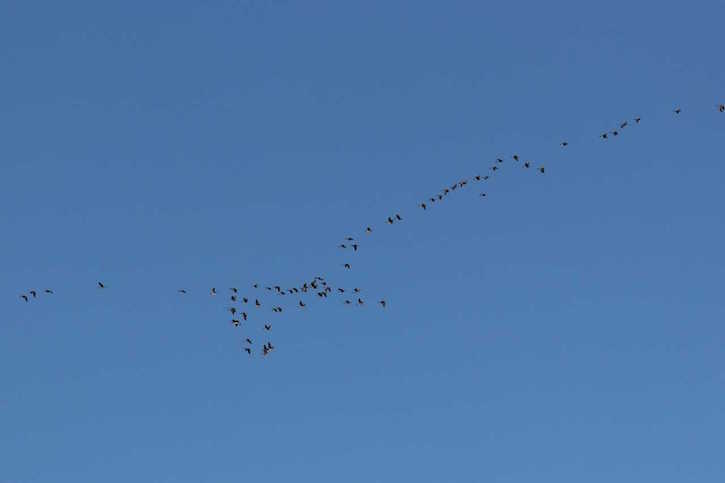 Canada Goose (~ 200) – ~ 50, various; ~ 150, flock overhead at The Warden’s, moving south. American Black Duck – common; throughout the marsh. Mallard (9) – 7, South Pannes; 2, Stage Island Pool. Northern Pintail (4) – South Pannes. Common Eider (4) – Emerson Rocks. White-winged Scoter (1) – parking lot #7 (seven), ocean. Black Scoter (1) – seven, ocean. Common Goldeneye (2) – hens; parking lot #3 (three) ocean. Red-breasted Merganser (3) – Emerson Rocks. Red-throated Loon (5) – 4, seven ocean; 1, three ocean. 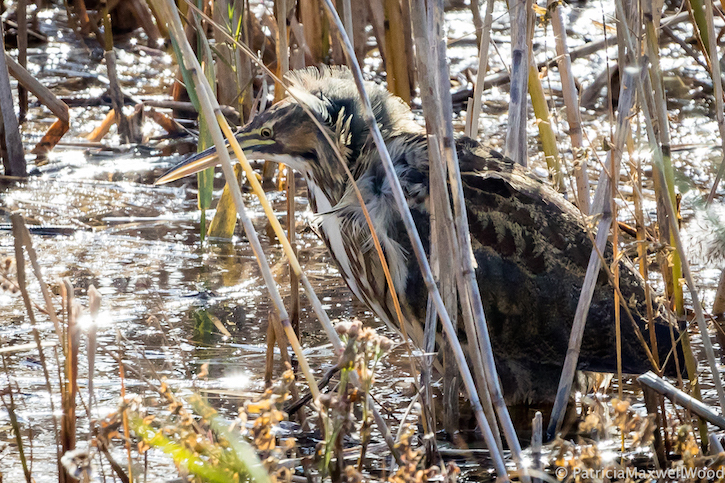 American Bittern (1) – Bill Forward Pool, from Hellcat dike (thanks MaryMargaret & Dave Adrien). Northern Harrier (1) – over marsh north of Cross Farm Hill. Black-bellied Plover (1) – seven beach. Dunlin (~ 18) – three beach. Northern Flicker (2) – three boardwalk. Northern Mockingbird (1) – parking lot #7. Snow Bunting (3) – small pannes. Song Sparrow (1) – The Warden’s. Dark-eyed Junco (2) – roadside between parking lots 1 & 2. Northern Cardinal (1) – Hellcat parking lot. This entry was posted in Birding on November 18, 2018 by David M..